111-121 California Avenue, Reno, Nevada. 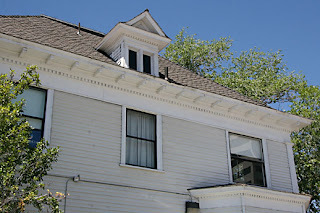 The grand Levy House can be found near the intersection of S. Sierra Street and California Avenue. William Levy was one of Reno's many successful entrepreneurs, who made his fortune through his mining interests in The Unionville Mining Company, and his very successful mercantile business, The Palace Dry Goods Store, which was in business until 1932. William Levy wanted to build a glorious mansion, to showcase his wealth. So he had this imposing, grand home constructed in 1906. I agree with the description of this mansion, as being an "elegant example of Classic Revival architecture." This imposing mansion is three stories, with an attic and cellar. 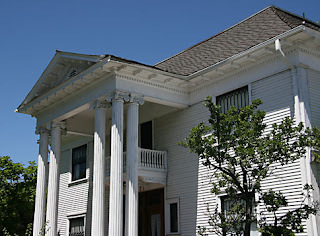 The home has a most impressive entry way, complete with Ionic columns, a two story portico, a hipped roof and gabled dormer windows, and of course pediment and dentils. We got a peak from the street of the inside decor of the back rooms on the second floor. Lovely wood paneling graced the spacious rooms. Another source described the staircases as being rather steep. Looking at the mansion, there is something a little odd about the way it sits on its lot, as well as the lack of grounds that this kind of home usually was built upon. One notices oddities; No balcony where french doors open up. I found out later that The Levy Mansion used to face S. Sierra St., which was then called Granite Street, when Mr. Levy was alive. When he died, his mansion and property was pass onto his two surviving daughters, Mildred and Fritzi, as his wife was already dead. It seems that Mildred and Fritzi had very different ideas as to what to do with this property, and got into a huge disagreement. A compromise was hammered out. This huge mansion was "reoriented" 90 degrees, to the west end of their property, leaving the east end available for commercial development. Mildred and her family continued to live in the mansion, while Fritzi, the unsentimental one, built a gas station on her side, and lived in San Francisco. Unfortunately, Fritzi's gas station was plowed under, and the land taken by the city so that S. Sierra St. could be widened. The Levy House is listed on the National List of Historic Places, giving it protection from any more city projects. After the family stopped living in the mansion, it was rented out to various businesses. One such business was The Metro Day Spa, who experienced paranormal activity to the extent that a medium, Debby and her husband Mark, were requested by the owner of the Metro Day Spa to investigate. As of July, 2008, when Tom and I visited it, The Levy House now is the home of some academic offices, for one of the nearby colleges; including History and Psychology, along with a few others. It is probably only open during the day. This leaves the mansion to the entities who haven't left this world yet. Strife and tragedy are not strangers to the people who lived in this house. While strife and tragedy develops character and faith, these two realities of life can also cause hauntings, from entities who don't know they are dead, or can't let go of this world because of the trauma of what happened to them; or simply are not accepting the fact that they were so unexpectedly killed /died before their time, with so much to look forward to and do. Deadly diseases, dumb / fatal accidents, and guilt associated with life's experiences are probable causes for the hauntings here which keep the joint jumping! Sounds of running foot steps have probably been heard on the second and and third floor hallways. 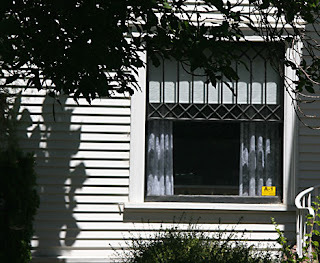 Unexplained cold spots, cool breezes and chills have probably been felt by the living, especially in the rooms located in the back of the house on the second and third floors. Items have probably been moved and put in odd places. Feelings of uneasiness, headaches are probably experienced in certain parts of the mansion, like the cellar, attic and stairways. The living are perhaps having the sense that some unseen presence(s) is/are watching them as they go about their business at hand. Oh yes indeed, in a big way. 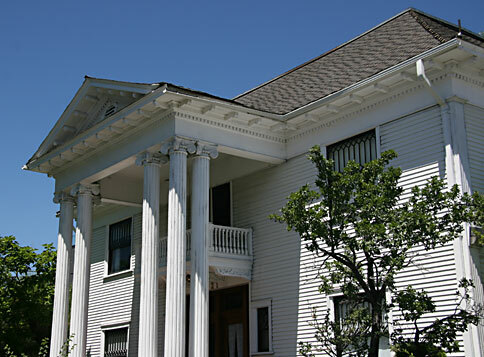 When the Levy Mansion was the place of business for The Metro Day Spa, the paranormal investigation team of Mark & Debby, spirits-speak.com, came and conducted seances, and paranormal investigations, at the request of the Spa's owner. This owner wanted to know who was haunting her place of business. Mark & Debby recorded many clear EVP recordings, and got clear video of orbs in the 2nd floor back room on the left side of the mansion. Psychic impressions that Debby received in her visits to the mansion, and what she learned from a series of seances, mostly held in the attic, made sense of the paranormal occurrences that the living had experienced in this old mansion. In the Attic: Debby came in contact with 3 children. A young boy died of a disease sometime in the house's history. She thinks that he finally went to the other side. Two 9 or 10 year old girls: One of these entities is a ball of fire, energy-wise, and is the one who runs all over the second and third floor, and outside as well. A female entity, the victim of a fire, which had started in the basement. A male entity, who is closely connected to one of the young female entities, as he is described as being an over protective father /uncle type. Perhaps this male entity felt responsible for the active girl's death, and is trying to make up for his perceived inattention which may have led to the girl's unfortunate demise. 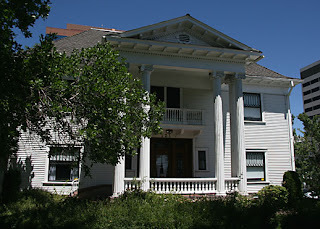 For more details of these hauntings, and of the investigations conducted here, be sure and visit: spirits-speak.com.